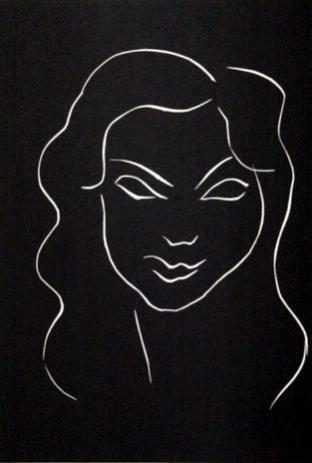 I see from AbeBooks.co.uk that among their top ten most expensive sales in September there is a copy of Dessins, thèmes et variations by Henri Matisse. First published by Fabiani in Paris in 1943, this volume features an introduction by Louis Aragon and a poem by Tristan Tzara. It recently sold for £3,674, but if you’re interested, there are still copies available on AbeBooks, starting from £3,829.27 (plus shipping costs, of course): you can get your copy here. 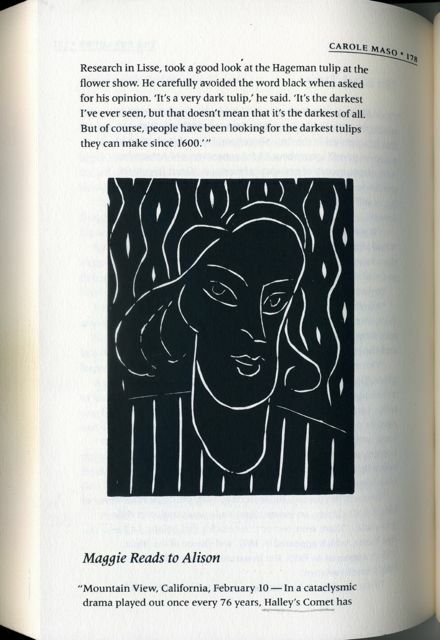 Pictured above left is the drawing by Matisse shown to illustrate the volume on AbeBooks, and it immediately made me think of two Matisse drawings I saw reproduced in the novel The Art Lover by the New Jersey-born novelist Carole Maso (first published by North Point Press in 1990, the novel was issued in 2006 by New Directions: see the cover shown below left). 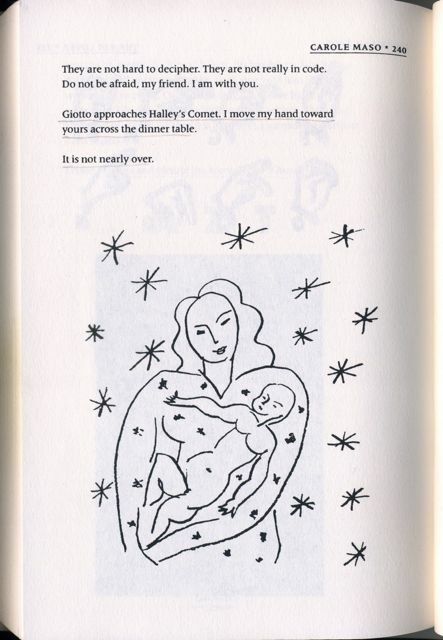 The first of these two drawings (picture below centre) is entitled Head of a Woman, while the second (pictured below right) is entitled Virgin and Child on Starry Background. 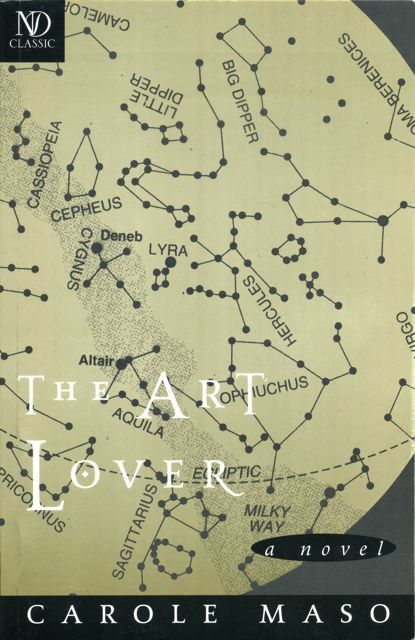 And it struck me that, although I’ve already published close to 20 posts here, I haven’t yet written about The Art Lover, despite the fact that it is one of my favourite novels and, I would say, one of the best picture novels I’ve read. It tells the story of a (woman) writer dealing with the death of her father and that of a friend in a most refreshing manner, and besides these two drawings, it features other artworks, photographs, and newspaper clippings, all of which form a powerful and coherent whole with the text: both the pictures and the text are equally powerful and work well together. What’s worse, I realized that so far I hadn’t published a single post on any woman writer, not one. And yet I’ve read, perhaps not all, but quite a lot of picture novels by women writers – from Leanne Shapton to Lynne Sharon Schwartz, from Theresa Cha to Marianne Wiggins, from A.S. Byatt to Lauren Groff – and I have no excuse for not writing about them earlier. So shame on me (but I will return to these writers and books in more detail in the future). Is it any different in the world of literature or of books? I don’t know, but it’s worth pointing out that of the above ten most expensive titles on AbeBooks, there is only one by a woman writer, namely P.D. James: a first edition of her novel Cover Her Face, published by Faber in 1962, sold for £3,281. Ironically, fifty years on, that title does not seem to have lost any of its relevance. 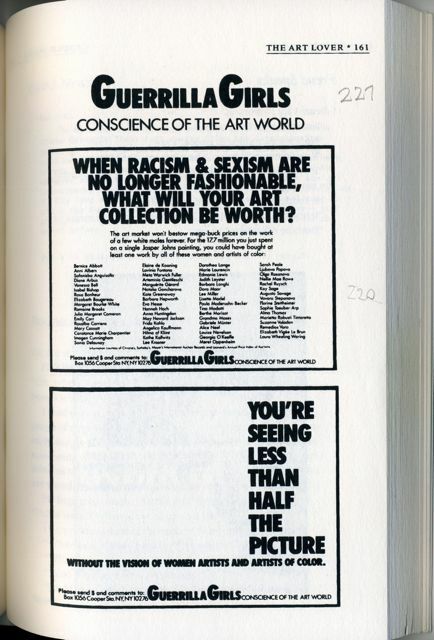 This entry was posted in Carole Maso, Picture novels and tagged Art Lover, Carole Maso, fiction, Guerrilla Girls, photography, picture novels, women artists, women writers. Bookmark the permalink.